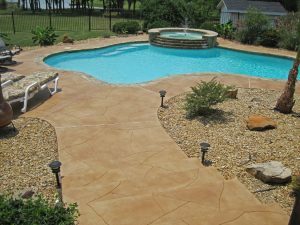 Concrete walkways and driveways are not just pathways to get you to and from your destination, they are great ways to add some serious curb appeal to any Fort Worth property. At Blooms Landcare, we recommend that you consider these three great design ideas for your pathways. Adding borders can transform a plain and boring pathway into a unique and interesting surface. Borders can be used to protect the lawn from stray feet and add a great deal of character and uniqueness to any home. They are a great way to draw attention to little details or add some personality where there is a need for some flair. There is no hard and fast rule that all concrete walkways have to be straight. Add some dimension to your property by giving visitors a better and appreciative view. Curved and twisted pathways help to add a natural and organic appeal to your home. Curved pathways also make it easier for one to add border plants to enhance the appeal and view of their home and lawn. To accent the delicate features of your lawn or any intricately designed driveway and walkway, consider adding some color. Whether you want to offset the foliage, add some warmth and undertones to create different depths, or add some excitement to the property, the use of colors is an economical way to liven things up without making any drastic changes to your home. Professionally designed concrete walkways will significantly add a unique and timeless appeal to your property and increase its value. Whether you want to do something new with the layout of your Fort Worth property or if you have some landscaping ideas in mind, our landscape professionals will make your landscaping design dreams come true. Contact Blooms Landcare at (817) 688-5352 for a consultation and estimate today.